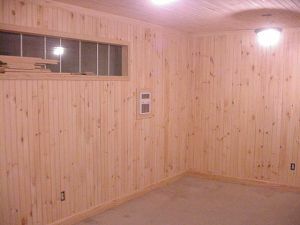 Real wood paneling adds charm and warmth to any room. Using individual tongue and groove boards, the installation may take more time than ply-panels, but offers depth and a rich look. The trim moldings compliment the natural wood effect. Add door and window trim molding. Turn off power when working around electric outlets or lights. Keep area clean to avoid falls from step ladder.